The legendary jockey Josef Váňa (50) doesn’t typically concern himself with financial management or cash flow, but he coordinates a team of employees tending to the 60 horses in his two training schools, while preparing to ride in a steeplechase . 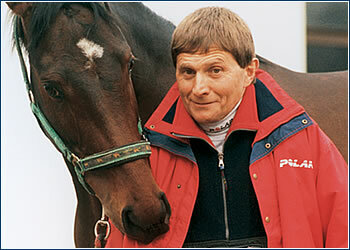 You’re one of the most famous Czech jockeys ever. You’ve won Velká Pardubická several times. Now you make your living training horses. Is it your hobby, or is it your business? It’s my life now. True, I started out riding as an amateur. Before the revolution I worked for the mountain rescue service and at ski lifts. Horses were nothing but entertainment to me; I never even got any financial rewards. But after the revolution I discovered that I couldn’t stay in the mountains. I didn’t have the money to buy some lifts and go into business. So I decided to do what I knew best, and went to Germany to race horses. Were you already a horse trainer when you were in Germany? I rode as a professional jockey for one stable in Baden-Baden. I’d been there over three years when I was injured. After six months of being laid up, I found that my horses had become spoiled. It made me mad, and I returned to the Czech Republic. I’ve been in business since 1994. I rented two farms – Bohuslav and Mlýnce – where we are currently training 60 horses, eight of which we own. In this country the trainer does everything, from finding the right people to finding feed for the horses. I train the horses to race in events that earn money not only for my company, but for the owners as well. The horses cost from the tens of thousands to the millions of crowns, and the people who buy them want returns on their investments. But of course that could never be reason enough to buy a horse. When I go looking for horses I go for the ones that don’t cost too much, but that could be good race horses with the proper training. Do you have time for anything but horses? What does your typical day look like? I’m with horses from 8:00 am until noon. The rest of the day I take care of paper work, management, and organizational matters. I deal with the authorities when I hire people or when employees leave, I take care of repairs, I meet with clients. My wife handles the accounting. We spend our weekends at races. The only season I have time for hobbies is the winter, when I go skiing. How do you recruit horses, or rather their owners, for training at your center? Do you advertise? Our stables are full, and our results are our advertising – we know how to get horses ready, and we do it responsibly. Who owns the horses you train? Owning race horses is a rather expensive hobby. So most of the owners are very successful entrepreneurs. I say “hobby” because you can’t make money on most horses. When you add it all up, the horse’s purchase price preordains a loss. About twelve, two of them jockeys. Also, trainees come to us from Chuchle to practice. We all do the same work, there are no differences among our jobs. Jockeys take care of their own horses, too. How do you select employees? I like people with temperate dispositions. I don’t want any loud voices around the horses. But it’s getting harder and harder to find new people. British scouts are scouring the country, and many young people are leaving to work in England, Switzerland, and Germany, where the pay is better. Is there any way you can induce them to stay here? No way. If I get eight thousand crowns from an owner, I’m lucky to be able to feed the horse with it. Working with horses doesn’t pay well. They also leave to gain experience with other languages. And I’ll do it – at the beginning of summer holidays I’m putting my twelve-year-old son on a plane to England, so he can learn the language. 1980 Earned his amateur jockey’s license and jockeyed Paramon and Železník at the Bruntál-Světlá Hora stables. In between served as head of ski center. 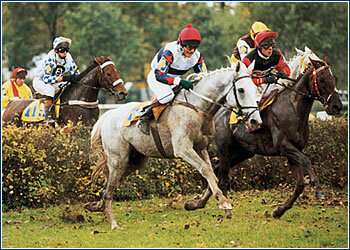 1987-91 Four-time winner of Velká Pardubická steeplechase riding Železník. 1992 Begins training school at the Bohuslav stables, near Karlovy Vary. 1997 Won the Velká Pardubická steeplechase for the fifth time (the only jockey in history to do so), this time riding Vronsky. 2001 Leases Mlýnce, a center on a par with western European stables (including a riding ring and a solarium for horses). 2002 His center boasts 39 horses winning races, with several million crowns in prize shares. 2003 Preparing for what will probably be his final Velká Pardubická. Nevertheless, you still have people working for you. How do you motivate them? Unlike other stables, this company always pays its employees on time. In short, we try to be nice to each other. No shouting here. Working with animals is much different from any other business; many people work here because they love horses, not for the money or because Mr. Váňa is nice to them. It’s a bit different with the jockeys. They’re here to learn something, to make money racing, because our horses are winners. Does knowing how to handle horses make it easier to manage people? I’ve been managing people for 25 years now, and I think I can get along with them, and they know it’s better not to get into a scrap with me. It’s much easier with horses. If you want something of them, they understand, they fix it in their minds, and they do it. It doesn’t usually work like that with people. Are you a bit of a dictator, or do you discuss matters with those around you? I like to hear the opinions of others. It’s important to be surrounded by people who are equally interested in horses, so you can speak to them as peers. Their knowledge of horses is different from mine. I’m always trying to push them, to get them involved. I try to get them to do their best. But it’s also good to know how a horse is eating, or whether it’s tired. But your employees, the jockeys, also compete with you. Doesn’t passing all your jockey know-how on to them put you at a disadvantage? True, I teach the jockeys everything I know, and then all of a sudden, while racing in Pardubice, I discover that my student is standing where I’d like to be. But I have no regrets. If a jockey works for me, it’s in everyone’s interests that his results are as good as they can be. I try to pass on everything I know, because it’s good for me, too. If we don’t win, we don’t make a living (ed. note: the trainer gets a percentage of the prize). You say that horses are a losing proposition. But such a thing has no place in business – how do you plan your cash flow? When the money’s there it’s there, when it’s not it’s not, that’s all. When it’s there I buy a car or a horse. When it’s not I don’t spend it, and I decide to go back to Germany. But most of the time we manage to win something. Would you turn to others if a crisis came up? Everyone has to take care of himself. This is my firm. I’m responsible for it.